Since 1976, our family has been proudly making some of the most sought after cheeses for Alberta’s food service providers, retailers and cheese lovers alike. We’ve had the pleasure of manufacturing, importing and distributing cheese and other food products from around the world. Today we still follow traditional manufacturing processes in a modern facility to bring you the best quality at the highest standard possible. From our family to yours, welcome to Alberta Cheese Company Ltd.
With a passion for making great cheese and a strong sense of pride, Frank Talarico packed up his family and set off for the West. Little did he know that more than 40 years later, his ambitions would help create a Calgary success story… A success story founded on his relentless attention to his cheese, his customer and his family. Through a loving family atmosphere. Today you’ll be comforted to know that everyone at Alberta Cheese continues to live by these principles. From Frank’s now adult children who work together to run the business with love and attention to detail, to the long standing employees who carefully make, package and deliver the cheese to their valued customers, everyone at the Alberta Cheese family continues to live out these principles daily. 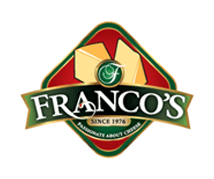 In fact, don’t be surprised to see Frank out back inspecting the fresh milk or out at the retailers arranging his cheese on the shelf. You might say, while this roots are Italian, his veins still flow with cheese.